Diversity is not always a bad thing. Sometimes in our professional lives there are others that simply don’t agree with a decision that we’ve made or a new policy we may have implemented for the office. Being a leader of others in the business world is never an easy task but the rewards can be well worth the effort if you have the where-with-all to stick to your guns…. well, sometimes that is. I have learned in the past that being the one in charge does not always make me right and I’ve learned many valuable lessons simply because someone challenged my decision. From a simple negative comment to an outright refusal I owe a lot to those persons whom cared enough to voice their disagreement about a particular situation. Don’t misunderstand what I am saying, there are certain issues that I simply won’t budge on because experience has taught me the right way to handle that situation but sometimes it pays to listen to others if they don’t quite agree with you. The truth is that I have learned to actually value disagreement and to not take it personally as I might have in the past. It is through our mistakes that we learn and sometimes we need someone else to point out that maybe, just maybe we should reconsider a course of action that we have decided upon. Sometimes dissent is the best teacher and allows us to see something from an entirely new perspective that we had not considered before. Seeing things in a new light could cause us to make an even better decision to deal with a particular situation and might be just what we need at that time. 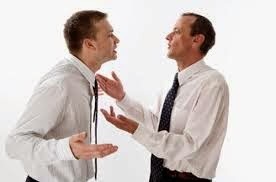 As leaders in the business world (as well as at home) we must learn to embrace criticism, even if our natural tendency is to immediately defend our position. Always be willing to hear the other person’s point of view, even if it is in a raised voice. Personal growth is not always easy but seeing the results of our decisions through other people’s eyes is one way to improve our relationship with coworkers and loved ones. I can’t think of a better way to become a leader worthy of being followed than to learn from others and to value their opinion, even if it is different from our own.